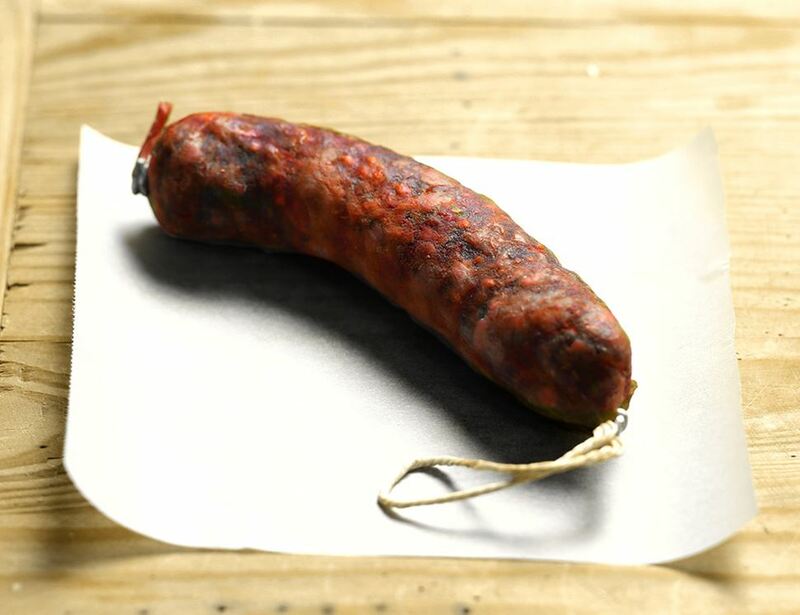 A stunning organic chorizo if ever there was one, made with a blend of chilli and turmeric for something that's a little bit left of centre and completely delicious. Having been in partnership since 1990, Chris, Denise and Amanda at Peelham Farm really know a thing or two about farming and the great outdoors. Chris has farmed since his early teens and has a real appreciation of the land, while Denise is no stranger to agricultural economics. Chris keeps his hand in the farming end of things, ensuring the care and well being of the home breed, slow grown animals is tip top whilst Denise looks after the butchery and food. *Lean trimmed pork meat, *Hard Back Fat, *Red wine, *Turmeric, *Paprika, *Smoked Paprika, *Ground black pepper, *Garlic, *Oregano, *Cumin, *Chilli, Curing salt (E250), Natural beef sausage casing, QUID 60% * = produced to organic standard.